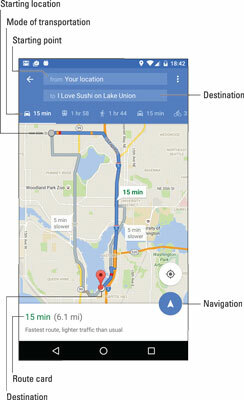 One command that’s associated with locations found in the Android’s Maps app deals with getting directions. The command is called Route, and it shows either the Route icon or a mode of transportation, such as car, bike, bus, or ornithopter. Tap the Route icon on a location’s card. You see one or more routes illustrated on the screen, similar to what’s shown here. The top of the screen shows either your current location, “Your location,” or a specific address. The bottom location shows the destination, such as the I Love Sushi restaurant in the figure. If necessary, set a starting point. The starting point is listed as Your Location, which is the phone’s current location. You can type another location or use the Home or Work shortcuts. If the starting point and the destination are reversed, tap the Action Overflow and choose Swap. The available options vary, depending on your location. In the figure, the items are (from left to right) Car, Public Transportation, On Foot, Ride Service, and Bicycle. The route card’s information is updated when you change the transportation method. To select another route, tap it on the screen. Alternate routes appear gray. When you choose one, check the route card to observe time and distance differences. To view a list of directions, tap the route card. You see turn-by-turn instructions for getting to your destination. To begin turn-by-turn Navigation mode, tap the Navigation icon. You can mute the voice by tapping the Action Overflow and choosing Mute. Otherwise, toodle on to your destination. To exit from Navigation mode, tap the Close icon on the screen. Two things are critical when you use your phone to navigate while driving. First, plug the phone into a power source, such as the car’s 12-volt power supply, formerly known as a cigarette lighter. Second, obtain a windshield-mount phone cradle. Together, these items can help you quickly and safely get to your destination. The map shows your route, highlighted as a blue line on the screen. Areas of increased traffic are shown as orange (slow) or red (stopped). Road construction is also shown on the route, as are any toll roads or bridges. If you don’t like the route, you can adjust it: Drag the colored route line by using your finger. Time-and-distance measurements shown on the cards change as you adjust the route. The Ride Service method of transportation isn’t available everywhere. When it appears as an option, you see a card linking you to the Uber service, which you can use to get to your destination.